There’s no way hiding it: quilting is no longer a tedious process, but it can be done much easier nowadays thanks to the new era quilting machine. Even though you love your queen size quilt in the end, getting there may be no pickle and it’s quite annoying to fight all day long with your regular sewing machine. Whoever got in their studio for the very first time a long arm-quilting machine…way to go, girl! However, we’ve come a long way since that day and today you can find more than just one model of long arm quilting machines. Which takes us to the next big question: what is the best long arm-quilting machine for you? Don’t worry, you’re not the only one who goes shopping thinking the more the machine does, the better your quilt is going to be. As a matter of fact, you should look instead for a simple, one-touch fingertip controls machine that features an easy thread path and tensioner that needs low to no maintenance. In addition, a smart table design wouldn’t hurt either- you want to make the quilt loading easy. If this isn’t the first time you’re quilting, you know that stitches vary in length and tension is not easy to balance. This is why you should keep an eye on a good stitch regulator so that all your stitches are consistent, from beginning to end. The bigger the sewing head size, the better- especially if you plan to make some big quilts. A 20-26” throat space on your machine gives you enough space for larger blocks, medallion quilts and wider borders also. Some say it’s best to get a table that is no less than 12-foot long for a king-size quilt. Go for the rugged, single-piece rollers and tables with four bars. Last, but not least, you should never forget about the warranty of your machine as it’s quite likely you’re going to quilt for a lifetime. Remember our “talk” about how a quilting machine needs to be simple in order to be good? 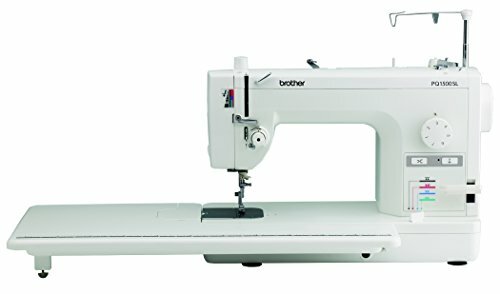 The Brother PQ1500S High Speed Quilting and Sewing Machine sure doesn’t make an exception and it does what it knows best: it quilts fast, easily and quietly every single time. 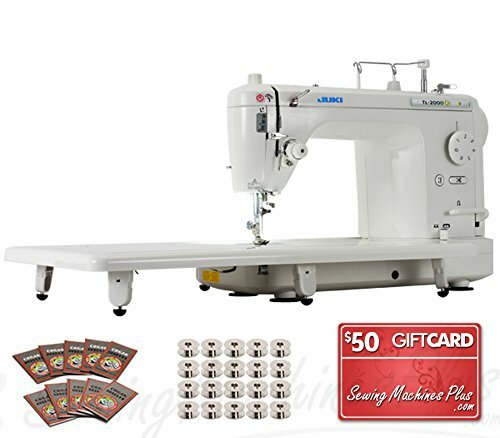 The machine comes with functional features that make quilting easy; even though some appreciate, it’s a better choice for the experience quilter and not the beginner one. The list of features begins with push-button auto thread trimmer, auto needle positioner and the built-in automatic needle threaded. The knee lever for presser foot lift may become useful at times, as it is the retractable drop feed dog control. The machine is very fast and sews up to 1500 stitches per minute. The adjustable pin feed mechanism, the 4 feed dog setting for better fabric control are also features that make the use easy. Thanks to the pin-feed mechanism, you may move multiple layers of fabric at once, getting more accuracy on your job. Moreover, when you want to expand the working space, get some help from the bed extensions table. The machine features easy access point so you don’t need to remove the table for replacing the oversized metal bobbin. Additionally, when you quilt, you get to use the knee lifter for more freedom. You may also sew seams in opposite fabrics with minimal risk for puckering due to the on-board fabric separator tool. The 4-color coded levels of feed dog adjustment sure help when quilting also. The list of functional features on the machine doesn’t end here and the dual thread stand means you can keep two thread spools ready. You get to use thread spool extender for fast and consistent threading also. The machine has a very good build and is very stable, even when used on high speed. It comes with clear instructions and a strong motor. The flaws aren’t deal breakers and we think the machine is still a great choice when you are dedicated to your quilting. The minute you know you’re into quilting for good, it’s the minute you decide you need to invest a bit more in a good quality long arm quilter that makes things easier for you. Don’t hesitate to give it a go with the Juki TL-2000Qi 9″ Long-Arm Machine as there are so many good things to say about this machine. The quality of the machine may be impressive at first, but the more you use it, the more you congratulate yourself for paying the extra buck on it. We’re not all talk though and we begin the list of features with the portability of the machine, which is not that typical for a long-arm quilting machine. 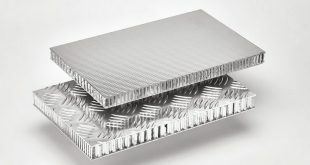 As a matter of fact, the machine is lightweight as it’s made of aluminum die-casting. This means not only a lighter machine, but also industrial-grade on your sewing just as well. The machine gives you good 9 inches of space between the needle and the arm so you may easily sew the large quilts or any other large projects. The frame of the machine is very large and very easy to setup, not to mention it’s re-buildable. And, if you’re not sure on how to begin, the CD and instruction that come along sure enlighten you. The machine comes with CAD Pattern Design Software so you may print custom-sized pantographs, blocks or borders right from your own computer. The features on the machine are well thought out and meant to ease up your efforts. You may set the speed through the foot pedal, easy and comfortable every time. The machine features built-in lights to light up your working areas and laser trace for the pantograph patterns. You may appreciate also the needle options and the thread cutter that saves you so much time and work. The machine comes with free metal “L” bobbins and free organ needles. It has a good build and is made to last. The drawbacks aren’t deal breakers for us though and we think the machine is worth to try when you want to step up your game on quilting. The more you quilt, the more you get an eye for the quality long arm-quilting machine. 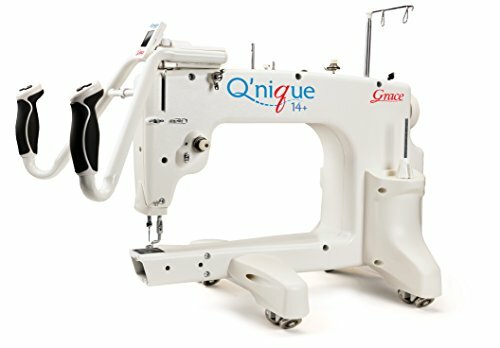 Therefore, it’s no surprise to anyone in the quilting when taking a closer look at the Grace Q’nique Long Arm Quilting Machine. The machine features a 14+-inch throat that allows you to sew larger patterns and blocks- main reason for getting a long arm-quilting machine in the first place. The larger throat space gives you more comfort, less cluttered working surface so it’s easier for you to make the king size quilts. The machine is not only about the large throat, but also about several features that count when quilting. For instance, the quick-access buttons ensure you easy control on all sewing functions, whereas the handles ensure a good, steady and cozy grip every time. We can’t overlook the real performances of the machine that is able to give up to 1,800 stitches per minute, which is sure fast for anyone quilting. Moreover, if the fast speed didn’t seal the deal for you, the stitch regulation may do the trick- we all like nice, even stitches all over our quilts! The stitches remain the same length, no matter if you speed it up or low when quilting. The multiple features don’t stop here and the machine also comes with advanced control settings so you may find the perfect setting for a specific job. The machine lets you choose from four sewing modes, with no need for you to change the bobbin. The easy-access bobbin sure makes the changing fast and easy. The machine comes with dual-cone thread towers and several accessory ports so you get to attach add-ons. Let’s not forget the OLED screen display that is user-friendly, easing your quilting. And, with be built-in LED lights your working areas become lit every time, giving you more efficiency and precision. The machine has a good build and the long arm sure has an ergonomic design. These flaws say nothing about the performance of the machine so this is why we still think it’s a great asset to add to your studio. No matter how confident you are when it comes to quilting, if you have the slightest doubt about your skills; it’s very likely that you may not be ready for the Juki TL-2200QVP-S Sit down Long Arm Sewing Machine. The machine is definitely not for the entry-level quilter and it’s a heavy-duty machine, as long as you are up for it. The machine offers 18×10” throat and it’s a free motion-quilting machine. 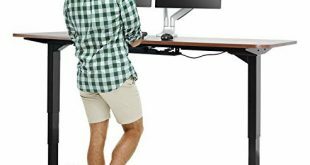 You may set its height according to your needs, from 30” to 34”. You need an experienced eye and a steady hand to get the best results with the machine. Its optional leafs make the table adjustable up to 50”. Going through the features, we don’t see many, but they are all functional and dependable for the free motion work. 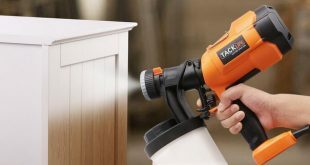 The machine comes with laser point guide, thread trimmer with foot control, automatic under-bed, and auxiliary hand wheel. The motor is a strong direct drive type and the dry head is limited oiling. The stitches are nice every time and the machine is easy to use by the experienced hands. The large color LCD screen is responsive and user friendly. The hand wheel is placed on the side of the machine so you may drop the needle exactly where you want it in your quilt. The needle up/down feature may be programmed so it ends every time with the needle up/down, according to your specific job. The machine is fairly easy to set up and has a rugged build, made for the intense use. 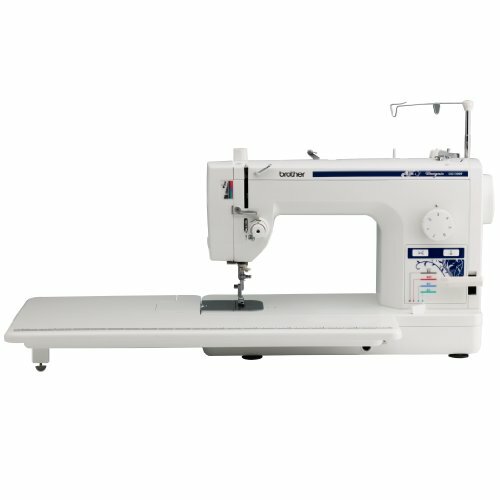 Despite the minimal issues, when in need for a workhorse long arm sewing machine, the machine is a good investment of your money. If you already stepped out your game when it comes to quilting and are willing to pay a bit more on a long arm quilting machine, than the Queen Quilter by Tin Lizzie Long Arm Quilter w/ Stitch Regulator & Frame becomes an obvious choice. For the money you pay, you do expect plenty of features that make quilting, no matter the size of the quilt, easy peasy. Let’s begin with the automatic stitch regulator, as no quilt looks good with uneven stitches. The machine ensures stitches the same length, no matter if you change the speed or direction. All stitches look nice and even, right from the beginning to the end. You may stop the machine in the needle up position or needle down position as the machine features the auto needle positioner. You don’t have to bend anymore or end up with broke needles, winning on the freedom aspect just as well. The 18” arm sure gives an amazing throat size between the needle and the back of the machine. You may not only quilt larger quilt patterns, but you don’t have to roll materials anymore. Even though it’s a large machine, it’s also easy to handle it and the built-in laser lights sure raise up the comfort, lighting the working surfaces. The machine comes with sample paper patterns so you don’t need to be a rocket scientist to simply follow patterns when operating the machine. The laser mounts on back of the machine and the ergonomic handles minimize your efforts when using the machine. The handles are easy to adjust up and down so the risk for carpal tunnel injuries is minimal. They provide comfortable operation, with less strain for wrists, arms and shoulders. The rubber on the handle sure does bring more comfort and ensures steady grip every time. The bobbin capacity fits the larger size of the machine so it’s more than double the capacity of any other regular sewing machine. You don’t need to change bobbins every 20 minutes in the end. The list of features also includes a hopping foot that keeps in place fabric while the needle finishes the stitch. 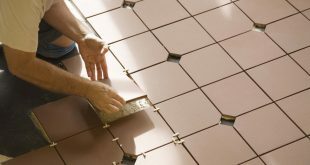 The foot height is adjustable up and down according to the thickness of batting or your material also. The foot’s designs also lets you stitch next to rulers and templates so everything is functional on the machine. The frame is designed according to the machine. It’s made of 13 ply laminated Baltic birch wood, which is high quality and very strong. The frame is easy to assembly so that you may quilt from laptop to king size quilts. It mounts on easy carry deck that glides very smooth. The bobbin winder has a well thought design also and allows you to wind as many bobbins as you need for quilt tops. The machine comes also with flex lamp, oil reservoir, and automatic needle positioner- all features that increase the ease of use. As long as you know what you’re up against, the machine is a reliable investment that you only get to do once in your lifetime. Best thing about the market developing so fast is that you no longer have to spend an arm and a leg for something really great. Therefore, instead of cutting off your next holiday, you can actually do both: get a new quilting machine and go in the dream holiday just as well. 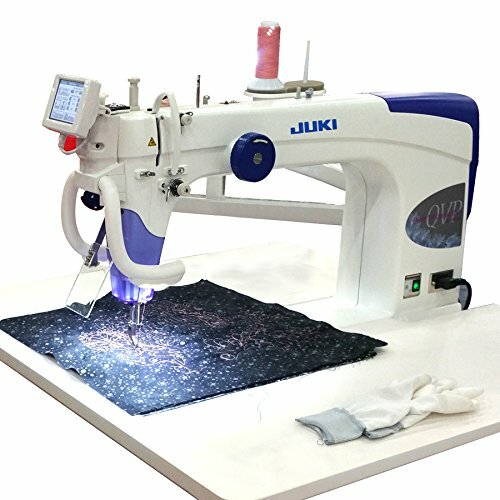 The Juki TL-2010Q Long-Arm Sewing & Quilting Machine surely brings to the table plenty of features and great quality and there are plenty of reasons for us to say so. The machine comes with a large throat area (8.5-(L) x5.9 (H) inches), so you can finally change that quilt for your bedroom. The list of features that count so much on a long arm-quilting machine is good enough for us. The machine comes with one pedal foot control and sliding speed control- so you really get to control the quilting. The LED lights make the working surface well lit at all time and the auxiliary table that comes along (590mmx277mm) sure gives you the extra space when in need. If we go through the numbers, we see the machine ensures 1500 stitched per minute with 6mm long stitch. The stitching is nice and even. The needle up/down looks good and the thread cutter is a cool feature. The bobby winch is fast and efficient and the machine is quite powerful. The machine is easy to setup, to understand and to use. It’s a mechanical machine so in case something goes wrong, you don’t have to go over your head fixing it. It’s a great option for straight stitching, but you may also use it for dressmaking, home décor items, tailoring. 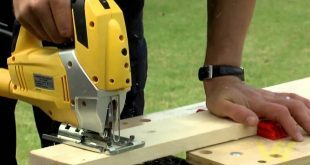 The machine is versatile and nothing stops you from mounting it into some cabinets, on machine quilting frames or simply use it as a tabletop machine. 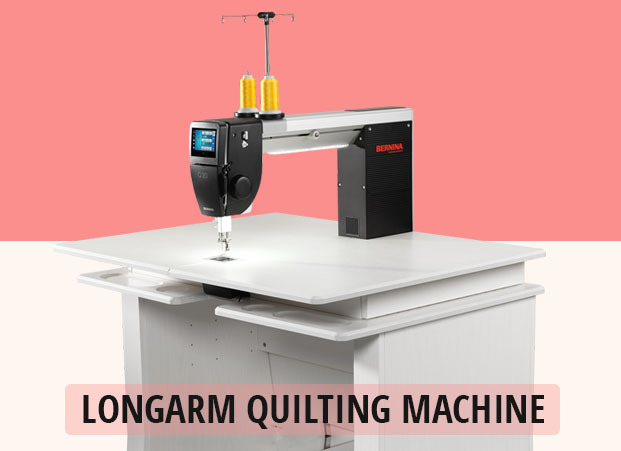 The long arm-quilting machine has a good build and is highly portable as it comes with a built-in carrying handle. These minimal issues don’t change your mind when it comes to the machine as it brings excessively many good things on the table for a very suitable price. Even though it’s not designed especially for quilting, this definitely this doesn’t mean the Brother Designio Series DZ1500F High Speed Straight Stitch Sewing Machine can’t handle the quilting jobs. The machine has plenty of features that recommend it as a good option for quilting and the needle felting attachment sure is one of them to being with. You don’t need to worry about working too slow as the machine is able to sew up to 1,500 stitches per minute. The stitching looks nice and even all the way down your quilt. The one-of-a-kind pin feed system lets you feed the various materials nice and easy every time. You may also move several layers of fabrics once at a time for more sewing accuracy. The list of features is long and we need to mention the bobbin case opening, the 4 color-coded levels of feed dog adjustment, and the very large extension table- so useful for the big projects. The knee lifter of the machine is so helpful when quilting and the on-fabric separation tool makes your quilting nicer and easier. The machine also comes with an automatic thread cutter and dual thread stand. The machine has a good construction and you may use it for various types of fabric, thin or thick. 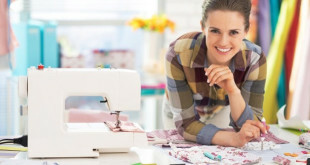 All in all, for the price you pay, you get a reliable sewing machine that makes it as a fair option for a long arm quilting machine. When you’re done, use a proper iron to make your quilt wrinkle-free, and do so on a suitable board.